The standard push-up is a fantastic exercise for training your chest, shoulders and triceps, as well as your core. At some point, though, you master the challenge of this standard move and need variety to keep upping your gains. The planche push-up is just the variation to offer up a serious challenge. You may have seen gymnasts do this move on the floor routine, the weight of their body shifting forward and the feet elevating off the ground as you press up and down with your arms. Mastering multiple reps — or even one rep — of a planche push-up is no easy feat. Progress your strength and balance to eventually master the move. 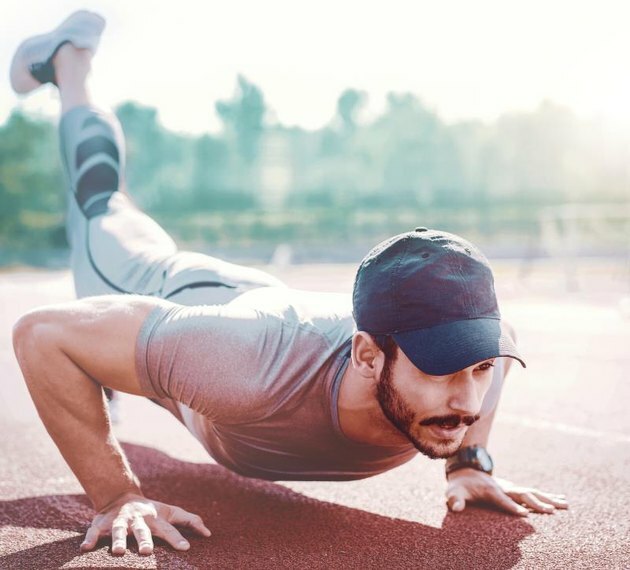 It's unlikely you'll be able to do a planche push-up without several weeks or months of training that builds you up to it. But to build, you must know what your final goal is. This is the full version of the planche push-up. Lie on your belly on the floor and extend your arms by your hips. Place your palms on the floor, so they are in line with your abdomen. Turn your fingers out to the sides of the room. Press up into the top of a push-up position. Lean your weight forward into your chest and shoulders, squeeze your legs together and engage your abs to lift both feet and legs off the floor. Only your palms make contact with the floor. Bend your elbows to lower your chest to the floor. Keep your lower body elevated the entire time. Extend your elbows back up to complete one repetition. Mastering the planche push-up is a matter of strength, but all the bench presses in the world aren't going to help. You do need strong pecs and triceps, but must also understand how to leverage your body weight by using your core. Start your progress toward planche push-ups by adding decline push-ups to your regimen. Place your hands on the floor and your feet on an elevated surface, such as a workout bench. This helps to build drive more resistance into your upper chest, shoulders and triceps. Mastering long holds — 60 seconds or longer — of plank pose and side plank are ways to start to develop your core. Once you can pump out decline push-ups pretty readily, practice handstands and handstand push-ups. Use a wall at first to balance, but eventually work your way away from the wall so you perform the moves without assistance. Practicing crow, a yoga pose, also helps you develop the control and core strength required to do a planche push-up. In this pose, you balance your knees against your triceps by deeply engaging your core. Hold the pose for several breaths and practice jumping your feet back, with control, and landing in the bottom of a push-up. Over time, you'll be able to pause just a moment before landing down, holding yourself in the planche pose. What Are Pseudo Planche Push-Ups?